THE BANKING INQUIRY is exploring the possibility of former ECB president Jean-Claude Trichet answering its questions at an event in Dublin next month. The Oireachtas committee has confirmed that Trichet will potentially answer questions from its members after he delivers a speech at the Institute for International and European Affairs (IIEA), a Dublin-based think tank, at the end of April. RTÉ is reporting that Trichet will take questions after the event, but a spokesperson for the inquiry would only confirm that negotiations about such an engagement are ongoing. “It’s a possibility,” the spokesperson told TheJournal.ie this evening of the possibility that Trichet will answer questions about the bank crisis after he gives a speech at the event. The European Central Bank’s refusal to cooperate with the Oireachtas committee investigating the causes of the Irish banking crash has caused controversy. The bank has insisted that its legal responsibility is to the European and not the national parliament. But in a letter to the inquiry in January, Taoiseach Enda Kenny said he recently raised the matter with both Trichet and his successor Mario Draghi. 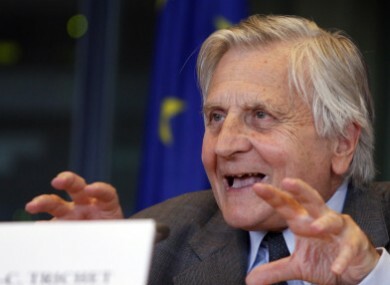 Trichet indicated that while it is not legally possible for him to go before a national parliamentary committee he could meet with Irish MEPs at an appropriate Irish institution or a third party could invite him to Dublin where he could respond to questions. This latter option now appears likely. The 11 TDs and Senators charged with investigating the collapse of the Irish banking system view Trichet as a key player. He opposed the idea of burning Anglo bondholders and is said to have forced Ireland to issue a blanket guarantee of all assets and liabilities in the banking system. Separately the inquiry is also considering a proposal put forward by current president Mario Draghi that the ECB vice president Vitor Constancio take part in an “informal exchange of views” with members. Draghi confirmed the offer in a letter to the independent MEP Marian Harkin last week. Email “How Jean-Claude Trichet WILL speak to the banking inquiry (sort of)”. Feedback on “How Jean-Claude Trichet WILL speak to the banking inquiry (sort of)”.